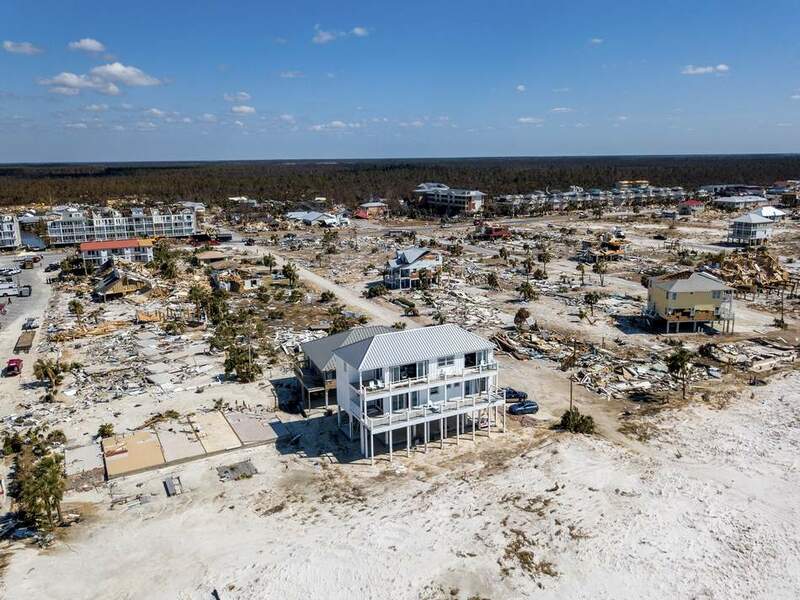 Because it was built far stronger than required by the building codes, this elevated house that its owners call the Sand Palace, on 36th Street in Mexico Beach, came through Hurricane Michael almost unscathed! Every hurricane is a learning experience. Florida is better at staging supplies, evacuating residents and rebuilding the power grid thanks to the lessons learned from these monster storms. Among the biggest improvements was the strengthening of Florida’s building code after Hurricane Andrew devastated South Miami-Dade County in 1992. But as Hurricane Michael exposed this month, the building code still isn’t strong enough to protect Florida’s most vulnerable communities. The state should look at further strengthening the code and requiring that all new construction take into account the impacts of climate change. As the Miami Herald reported, Hurricane Michael exposed a weak spot in Florida’s lauded building code. Though it is among the toughest in the nation in guarding against windstorm damage, the requirements for wind resistance vary widely by location. Across much of South Florida, the code requires that new construction withstand wind speeds of 160 mph, 170 mph or even 180 mph. By contrast, the design standard drops to as low as 120 mph in areas of the Panhandle hit hardest by Michael. Given that Michael made landfall as a strong Category 4 storm with 155 mph winds, even the newest structures along its path were no match for the hurricane. That helps explain the wide path of destruction across the heaviest hit areas, including Mexico Beach, Panama City and Apalachicola. The post-Andrew building code was considered a model. But it created a tiered system of protection, as the Legislature declined to apply the same wind-speed standards across the state that applied in Miami-Dade and Broward. Lawmakers considered South Florida a “high velocity” wind zone, in part reflecting the storm history of Florida and the likelihood for future strikes. Applying those same standards statewide was considered overly burdensome and expensive. For years, the Legislature also exempted new construction along the Panhandle from having storm shutters or high-impact windows. Though that exemption has gone away, many homes built in the interim were not adequately hardened. Much of Michael’s damage also came from a 14-foot storm surge, devastating older homes and buildings that do not meet current elevation standards. Experts are right that Hurricane Michael should force a review of Florida’s building standards. While newer homes generally fared better than older ones, the state needs to reassess the risks posed by high winds and storm surge. The minimum wind standards in the Panhandle, which range from 120 mph to 150 mph, seem too low given the vulnerability of the coast. With more extreme weather expected from a warming climate, the state needs to toughen its standards for how and where new homes are built. State and local governments also need to better locate and harden public buildings and utilities, even in inland areas, to protect against storm damage.